The hotel belongs to the Techno India group of Kolkata and expectedly the service and administration are run mostly by Bengali staff. One of the greatest advantages of this hotel is its location. 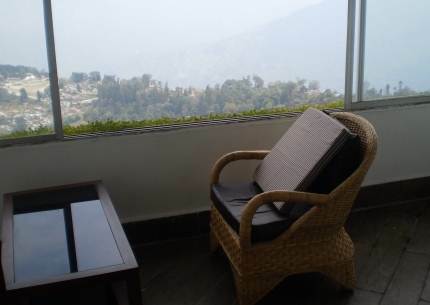 If you are looking for a hotel with great views of the Kanchenjunga snow peaks and the rolling mountains of Darjeeling, then there are very few hotels which can compete with this one. It's a relatively quiet place with lots of greenery although the Mall is only 5-6 minutes walk where you will find all sorts of shops and restaurants. The Retreat is located on the Mall Road (East) which overlooks Kanchenjunga. In fact one of the best public viewing areas on the Mall road partly forms the roof of it's open terrace. 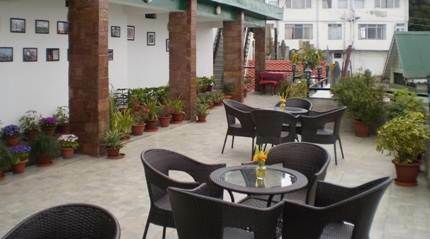 A stairway from the Mall Road leads down to the open terrace of this hotel where several tables & chairs are laid out for the guests to enjoy the views. It's also a great place to sip a cup of Darjeeling tea and have some snacks. Across the open terrace is a covered lounge area and the reception. The best rooms are located at the reception level while the other rooms are located at floors below the reception level. While most rooms have great views, the rooms at the lowest level face a narrow lane and some buildings blocking the views. There are 10 rooms in the hotel of three categories - Deluxe, Royal Deluxe and Executive. The Executive rooms are the best and have attached private balcony with lovely views. 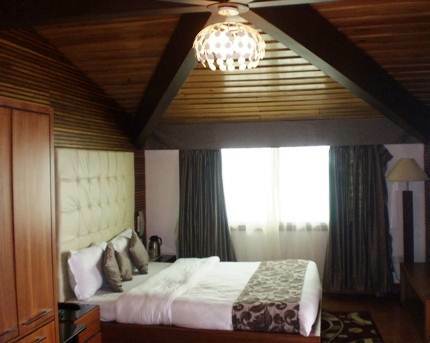 All rooms are nicely done up and quite clean, have wooden flooring and wooden paneling on the ceiling. Rooms are quite spacious. The bathrooms have modern fittings, western style toilets, running hot water showers. The restaurant Aroma is located at a lower level. It's quite spacious and also has a bar at one end. 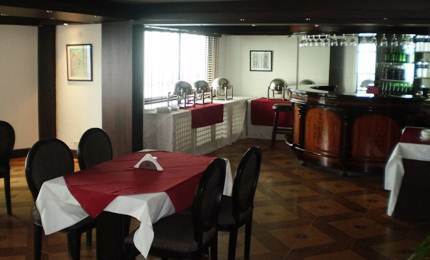 It's a multi cuisine restaurant serving Indian, Chinese and Continental dishes. The bar is quite well stocked. But the it's a bit dark inside. The staff are over all quite friendly and cordial. The Manager Mr. D P Sarkar has been running the day to day administration of the hotel since several years. I have seen him getting agitated with hotels vendors and staff, but he is a nice man trying to help out the guests as much as he can. Over a cup of tea he mentioned that he never had a formal training in hotel management and learned everything by himself in a hard way. The hotel has wi-fi internet service, which is available mostly at rooms and public areas around the reception level. Room heaters are included in the rates. There is a library. The Retreat is a 3-star category hotel with most amenities matching its category. Great location with excellent views from most rooms (but not all). Area is quiet although very conveniently located. 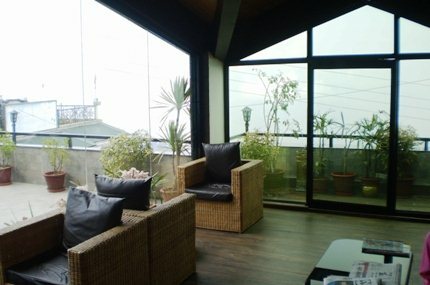 An ideal location in Darjeeling. The rooms are nice and comfortable with modern amenities. Beds are good. The service is overall nice and the waiters are friendly, but when full with guests and under demand, it can become below par. Food is average. The Mall road on which the hotel is located is ideal for a stroll or morning walk. You will find pines, rhododendrons and many other plantations on the observatory hill around which the Mall road meanders along. The room rates of the hotel are on the higher side for its category. So the value for money can be questioned during the high season when rates have peaked. If you are sitting on the outside terrace, public from the roadside viewpoint at a higher level will be looking over you. The roadside viewpoint is a public viewing platform that overlooks the terrace. So privacy can get compromised. The hotel is in a pedestrian zone and vehicles are not allowed in this part of the town. While arriving or departing, if you inform the hotel they will provide staff to carry your luggage from/to the nearest taxi point near Gorkha Bhawan which is about 3-4 minutes walk. The Retreat is located near Raj Bhawan (Governor House) on Mall Road East.